If you have ever had a cylinder head ported and polished you would know that it’s a highly skilled and time consuming task. Through hours of work using grinding and polishing wheels a factory finished cylinder head would eventually become almost a thing of beauty providing for maximum flow of both fuel/air mixture and exhaust gases. Today, computers are everywhere. In your home! In your workplace! In schools! Even in your washing machine! Of course, today’s cars are similarly computer endowed and there are also classic car gurus who have taken on computer technology to assist their fellow enthusiasts. 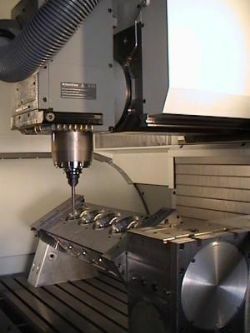 Take Adelaide’s Bullet Cylinder Heads for instance, who have adopted Computer Numerical Controlled (CNC) milling machines to ensure precise machining for every job. Co-proprietor Darren Palumbo told Classic Car Gurus that he and his partner Marcus Giobbi invested heavily in CNC machines as it was the only machinery available that moves in five separate axes that is essential for effective machining. Darren started his working career as a fitter and turner, while cars were his hobby. Like so many young blokes he was keen on performance vehicles and sought the assistance of an older gentleman more experienced in the preparation of performance engines. Time moved on and Darren found himself as the owner of the business while his mentor stayed on for a time to pass on his expertise. Trading under the name of Adelaide Engine Developments, Darren was working from a well appointed shed behind his home and worked almost exclusively on the building of new engines and servicing older ones. Marcus Giobbi was also a fitter and turner having served his apprenticeship with Darren. Marcus went on to work for Peter Schafer who was known as one of the leading cylinder head experts from the seventies to the nineties. Subsequently Marcus went on to form Heads Up Racing. We don’t know if it was a match made in heaven, but it just made good sense for Darren and Marcus to join forces under one company called Bullet Cylinder Heads. Now located in Adelaide, Bullet Cylinder Heads occupies a 200 square metre factory building. Previously it would take somewhere between 40 to 50 hours to perform the necessary magic on a single cylinder head. Now with the CNC milling machine it’s a matter of hand machining just one combustion chamber and once the shape is saved within the computer memory the CNC machine does the rest. Of course that only applies to an unfamiliar cylinder head as the computer memory is permanent for every time a cylinder head of a particular type comes in through the door. The advantages are clear, as not only is the milling machine far quicker, it is also more accurate and it eliminates variations between combustion chambers. Darren was quick to say that no matter how expert a machinist might be there will be differences when done by hand. At the moment stored in the memory of the Bullet Cylinder Heads CNC milling machine are the profiles of over 60 different heads ranging from Holden V8s, Harley Davidson motorcycle engines, small and big block Chev and Fords, Chrysler V8s as well as Nissan 4-valve heads. 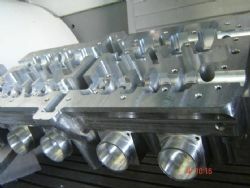 The machine is also capable of machining heads from solid billets and just recently a 50 kilo solid aluminium billet was turned into a 16 kilo cylinder head for a Suzuki motorcycle engine. Such precise machining is only possible through an expert contracted cad-cam expert and proper programming of the CNC milling machine. While cylinder heads are their bread and butter, Darren and Marcus continue to build performance and racing engines. 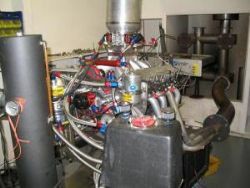 To keep the CNC milling machine company an engine dyno has been installed that is not only highly useful, but has become a drawcard to other engine builders for the testing of their engines. 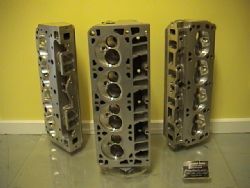 While recent engine competition rebuilds include small and big block Chevs and Fords, Holden V8s and Nissan SR20s, Bullet Cylinder Heads are well qualified to take on reconditioning of standard engines and such relatively straightforward tasks as the fitting of hardened valve seats for unleaded petrol use. In addition to cylinder heads and engines Bullet Cylinder Heads produce a range of components machined for solid billets. These include engine timing covers for Holden V8s that can be optioned with a removable cover plate allowing access for changes to cam timing. Also produced are billet alternator brackets for Holden and Ford V8s that once fitted, eliminate flexing on acceleration so that fan belts stay on the pulleys. Darren Palumbo is rightly proud of Bullet Cylinder Heads and commented that while it’s all right to have the equipment, they have also developed appropriate combustion port shape to use the equipment to its optimum use. He further stated that Bullet Cylinder Heads is the only CNC head porting business that had the expertise prior to buying the equipment. Bullet Cylinder Heads is located at Dundee Avenue, Holden Hills in South Australia and can be contacted on (08) 8261 8813. They have an excellent website - click the link below.